I got an order for New year cards . This is what I came up with. Mass production is fun and quick. 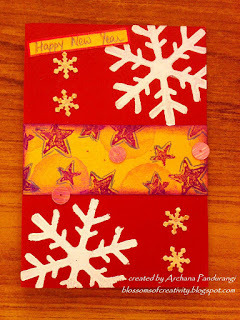 The white snowflakes are stamped and the smaller ones are punched. The sentiment is handwritten. 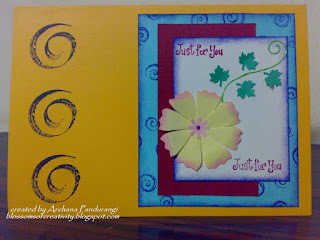 I started this card without a pre-planned layout.Ideas just kept on coming as I started with it. 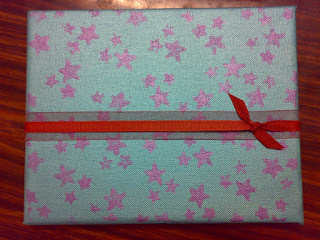 What I learnt from it is that you tend to have more fun making a card for which you haven't prepared much. A quick christmas card. The snow flakes are punched. The tree was cut from a DP. The sentiment is handwritten. 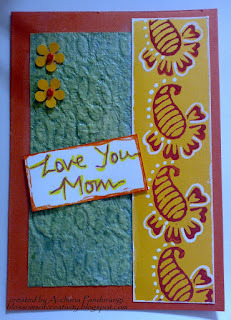 A friend of mine wanted to make a card for her mom. So I tought her how to quill. And this what we had at the end of it. She was happy. I liked it too. 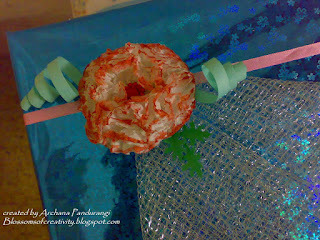 I made the flower with tissue paper and used a paintbrush to add red ink to the flower. 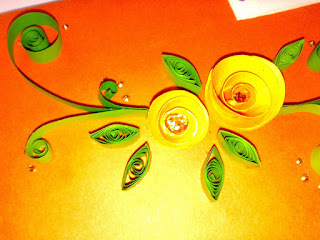 I made the green spirals with the help of the quilling tool. Added punched leaves. I used the reverse masking technique for the orange circle. Arranged those punched flowers and added embellishments. This was a quick and easy card. 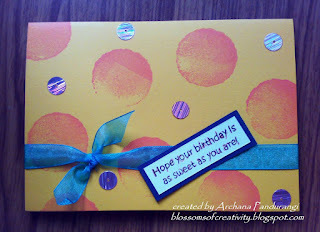 I stamped the circles randomly, adhered the shiny pink circles, tied the ribbon and added the sentiment. I just love this circle stamp. I tend to use it so much. 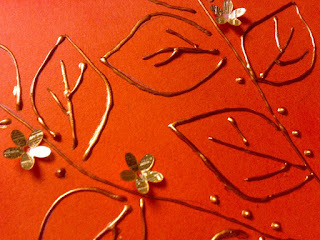 I love using flowers when I make cards. I feel it is the best way to express a lot. A flower thus has the power to say a lot with the least. The pink circle is done by the reverse masking technique. 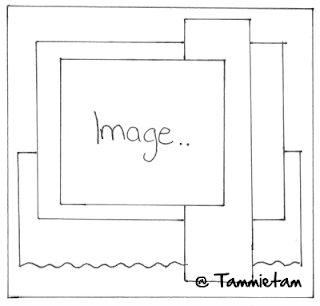 I have always loved making scrapbook pages manually but I must admit digital layouts are fun to try out too. If you haven't considered digital scrapbooking as one of your areas, I would recommend you to give it a try atleast once. 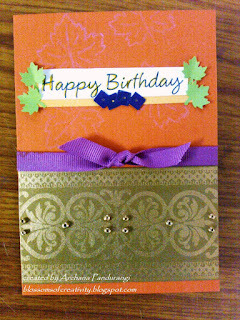 This is the card I made for LSC223 challenge on SCS. 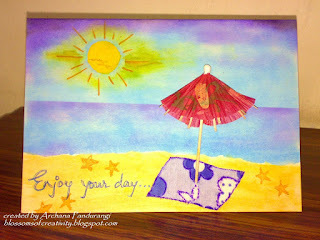 The challenge was to make a summer theme card. I used a scrap cloth for the mat. 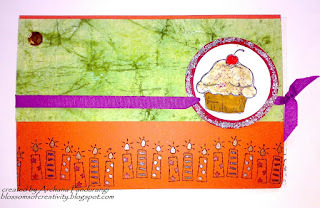 Here is my card for IC182 challenge on Splitcoaststampers. A simple card so nothing to explain. 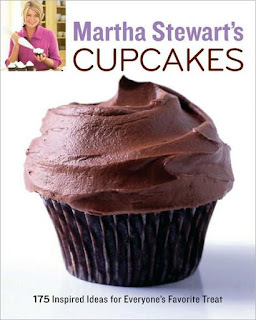 This is the book cover I was inspired from. This is the card MOM made for my birthday. I just love it! 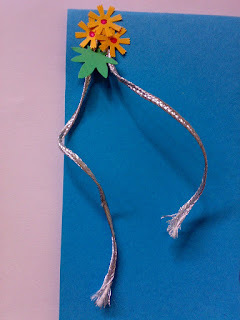 The flowers are quilled and the leaf is a real one she used. 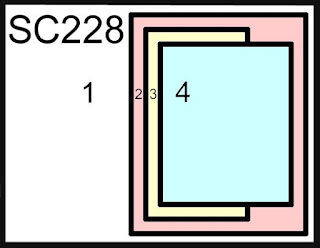 This card is known as SLIDER CARD. 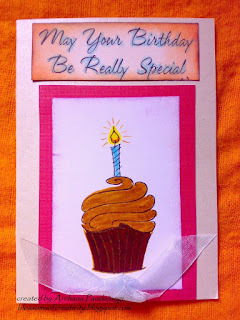 I made this card for my Dad whose birthday is on 28th May. I was born on 28th May too. So we share our birthday. Stamps are from Tags & More from SU! 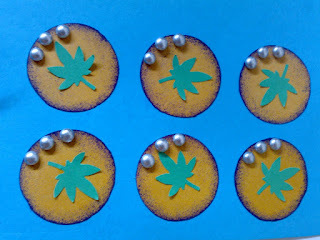 I combined it with this week's Dutch Dare challenge of using bling-bling and/or glitter. here's how it looks with the slider pulled out. 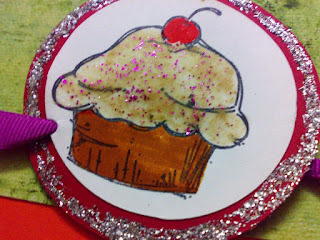 Here is the close-up of the frosting I did on the cupcake. 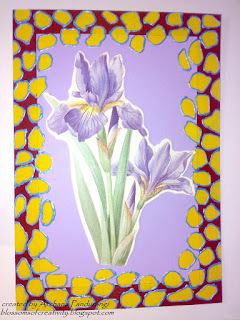 I changed the color of the base card and the layer and the main image.I used chrome yellow paint for coloring the mosaic border and the sky blue outliner to border it. The main image is a cut-out I had. A close-up of the border. 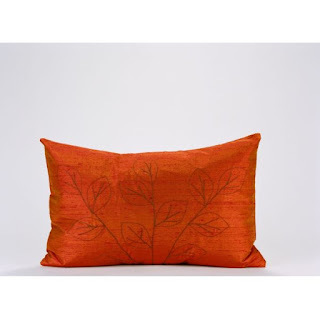 I received a KINSHIP AWARD from JUHI KHANNA. Thank you so much Juhi. Your comments really encourage me. 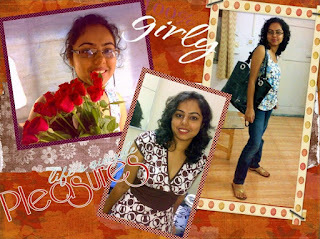 Juhi has lovely blog . 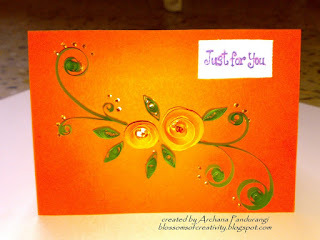 Do visit her blog for some fresh and creative ideas and inspiration. 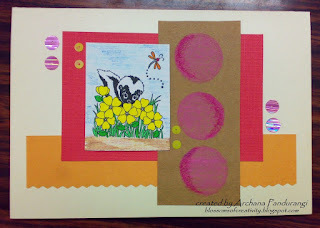 I made this card for this week's Inspiration challenge on Splitcoaststampers. I drew and cut out the mushroom in two separate papers ie. 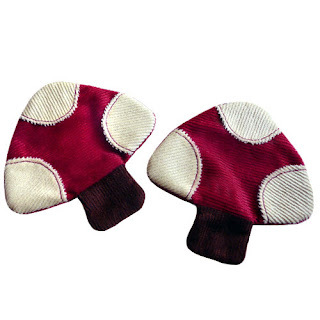 dark pink and brown. Painted the white spots on the mushroom and the grass. 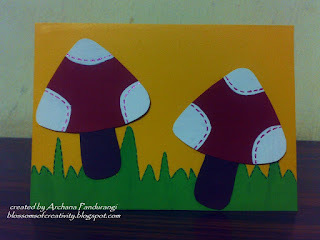 Used faux stiching on the mushroom as well as the grass. The picture below was my inspiration. LSC221- Circle of life. 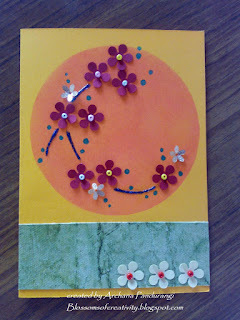 Used 2 circles in the card. I used the REVERSE MASKING TECHNIQUE for the orange circles.Cut out strips of black paper and tore it on one side. 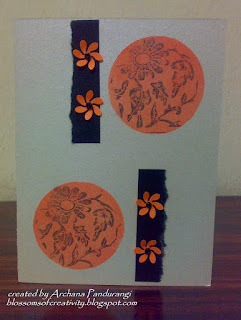 Adhered it and added orange punched flower with black beads. I made this card for the Inspiration Challenge 180. I drew the leaves and used a 3d outliner. Added golden flowers and a few dots. Sponged red ink around the image. The picture below is my inspiration. A close-up of the image. I sponged the sky and the land. 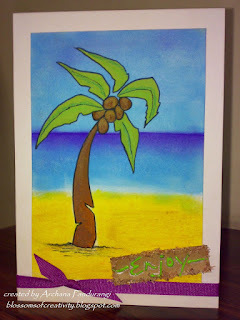 Drew the coconut tree and painted it for the opaque look. The sentiment is handwritten. I bordered it with the scrap(the scrap after the pencil is sharpened) of the rotating handle pencil sharpener. I love the look of it and just cant throw it away. 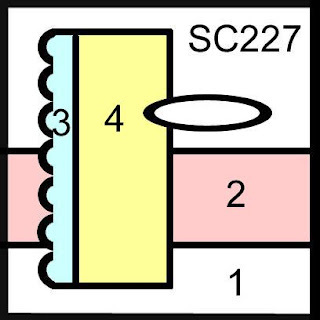 Here is the sketch for the CS228 challenge in Splitcoaststampers. 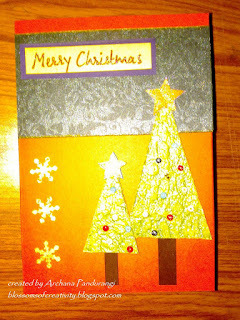 This is the card I made. I made 16 flowers the other day and was wanting to use it somewhere. So here it is. I cut out circles with the zigzag scissors,then drew the lines on the circle for the petals, held 8 circles at a time and cut them making sure not to reach the middle of the circle. 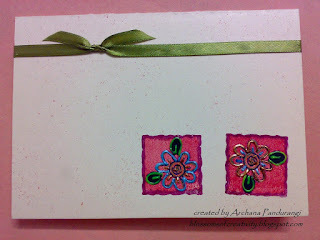 Curved the edges of the petals, sponged with pink ink and added the pink punched flower. I know its a little late but I wanted to make it. I used a wooden stamp here. 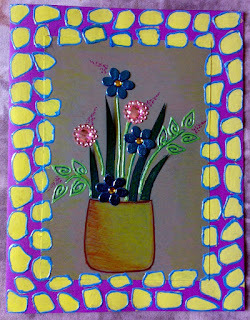 The text is handwritten.Added 2 punched flowers with beads . 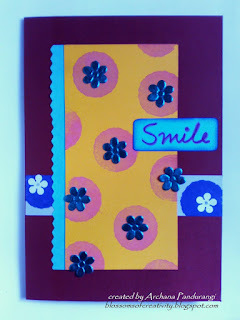 This is my card for CAS14 Challenge. I used the rock n roll technique for the squares(little shapes from SU!). 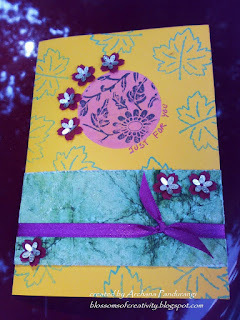 Then stamped the flowers from the set Tags n More from SU! and used Camel frolika 3d fineliner and Fevicryl 3d outliners to highlight them. Here is a close up of the highlighted images. 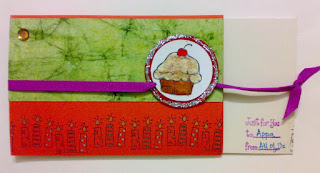 I made this card for the Splitcoaststampers' SC227 Challenge. I used the SU! Little shapes Circle stamp here. The white flowers are punched. The sentiment is handwritten. 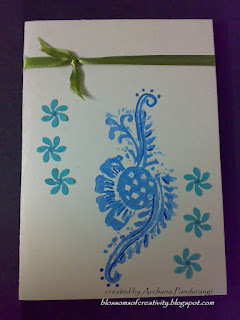 I combined 2 challenges:CAS05- use blue and greenCas07- PunchesThe image is of a carved wooden stamp. flowers are punched. Ive really started liking CAS(Clean and Simple) challenges. 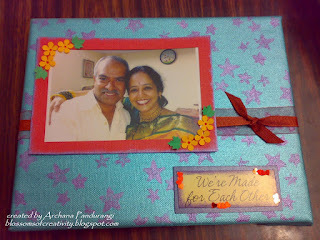 I made this gift for my parents' 25th wedding anniversary. 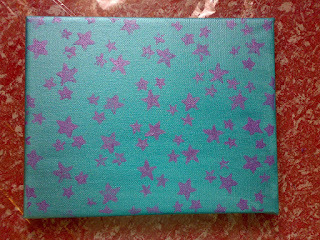 I used a 8" X 10"canvas for this one. Here's a tutorial. 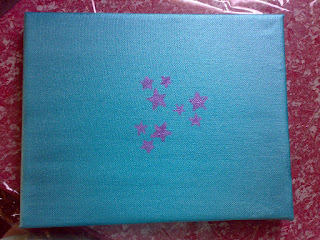 I used an acrylic paint(pearl finish) and covered the whole canvas. I used a sponge. The application becomes really simple. Then started stamping it randomly. 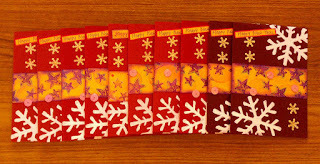 Completed stamping. I used another acrylic paint to stamp. 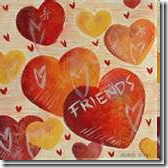 Clean the stamp as soon as you finish stamping. 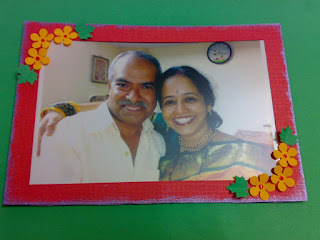 This is the frame I made for their picture. The flowers and leaves are punched. 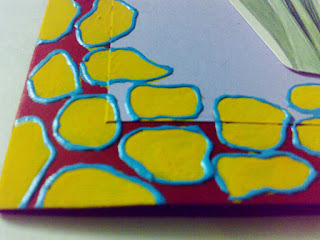 The edges of the frame is sponged . Mom iswearing a saree(a traditional Indian attire) and a lot of jewellery. 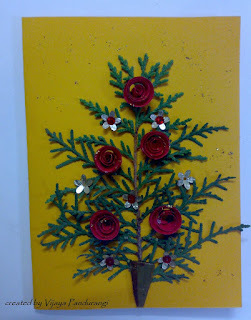 Here is another card made with quilling. 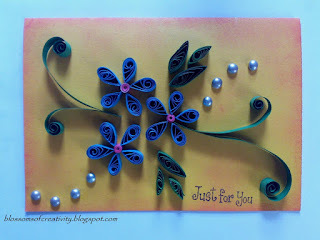 Here's a close up of the quilled design. 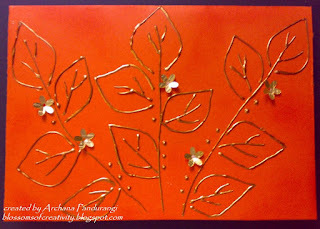 The dots are given with Copper 3d outliner. Here is my card for the CAS 13. It was a sketch challenge. 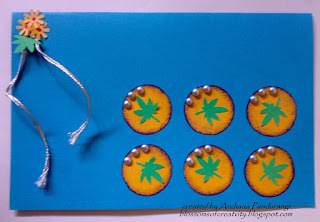 I made this card for the Dutch Dare Card Challenge. 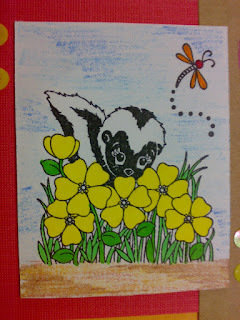 I used bright colors depicting Spring time. 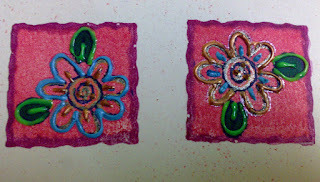 The image also has flowers in it.I used oil pastels to color the image.The circles are also shaded with oil pastels. Here is the close up of the colored image.